Have you ever listened to an album a few times on a stereo or in your car, and been underwhelmed--but then you listened to it on headphones and got blown away? 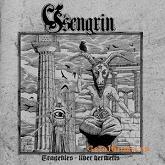 Tragedies - Liber Hermetis is French band Ysengrin's second full-length after forming in 2005. Their sound is death/doom (death growl vocals and an overall death sound at doom pace) with some black metal elements, including an occasional black metal rasp and a blackened guitar tone. They also use perfectly restrained synths for atmosphere. Setting them apart from the crowd are lyrics entirely in French and a healthy focus on the bass. The songwriting and overall album construction are very good. Frequent tempo/rhythm changes and great drum fills keep things interesting at all times, and the atmosphere feels like some kind of dark ritual. A couple of bass solos really serve to break things up (especially the compelling "La Grandissolvtion"), and an out-of-tune acoustic guitar is used in a few places specifically to unnerve you. They even indulge the occasional progressive tendency on a couple of longer tracks. But what really elevates this album is superb production. And I mean superb. It's organic, so you can hear fingers sliding up and down strings, and far from sterile. It's mixed perfectly, so each instrument can be heard throughout the album. And the use of stereo separation couldn't be better--never too obvious, but always enough so each ear hears something different. The Verdict: If you're looking for quality death/doom in a headphones album, Ysengrin's Tragedies - Liber Hermetis is a very good choice. I give it 4 out of 5 stars.